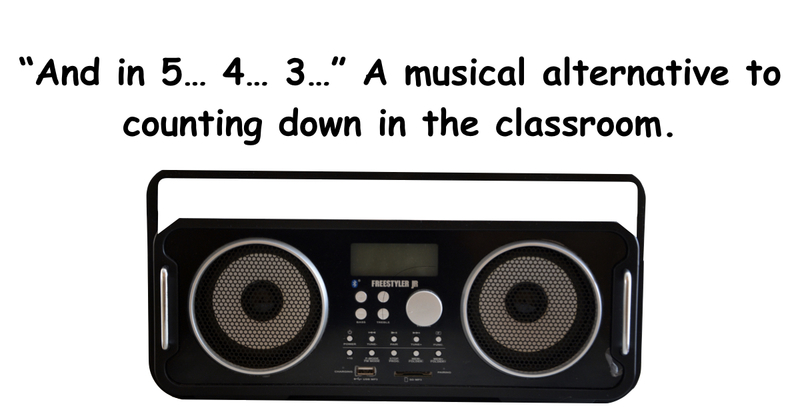 Add a Little Music to Your Classroom! We have all heard it and most of us have probably done it. The typical call for attention in classrooms tends to be counting down or something along the lines of, “If you can hear my voice, clap once. If you can hear my voice, clap twice.” In my classroom, instead of counting down, I would play a short 10 second music clip to grasp student attention and non-verbally communicate expectations. In the classroom, students can be conditioned to hear a specific sound and respond in a predetermined way. For example, if you hear a buzz, put your pencil down. If you hear a ping, make your way to your seat. If you hear a gorilla banging his chest, stand up on your chair. My point is, students can be conditioned to hear a song or sound then perform a task predetermined by the teacher. To keep things interesting and to incorporate more music into my classroom, I decided to use popular songs as music cues. When my students heard the 10 second clip of Can’t Hold Us by Macklemore, they would rush to their seats knowing that the lesson was about to start. When I wanted to give my students a short amount of time to discuss a question, they would hear a 30 second clip of Uptown Funk by Bruno Mars. My students not only were able to recognize what was expected of them, but they also quickly learned how much time they would have depending on the song. There are a few things that must be done for the successful implementation of music cues. 1. Practice with your students — It is critical that when music cues are introduced, you practice with your kids to make sure they understand the expectations. Have your kids walk around your classroom, play your music clip, and have them find their seats before the song is finished. This is also the appropriate time to discuss other expectations such as running and noise level. Teach them what each music cue represents and practice! 2. Slap hands on the desk — Be sure to always end your song on beat and teach your students to slam their hands down on the desk and give you immediate eye contact. By slapping their hands on the table, the kids must have removed pencils, paper, or other distracting items from their hands and by giving you eye contact, they are giving you their full attention. This one may seem odd but it is an important aspect of music cues. 3. Start your instruction IMMEDIATELY — The second the song is done and the kids have slapped their hands on the table, begin your instruction. If you do not start teaching right away, the hands will come up, the eyes will wander, and you will have lost your opportunity to hold full attention. This one is the key. Trust me (Or trust a big influence for this post, Hope King from the Ron Clark Academy). 4. Be consistent and repeat — Just like most procedures in your classroom, you will need to use music cues consistently to make sure students remember expectations and understand the procedure. The more you use it, the better they will perform and it looks GREAT for classroom observations! If you message FCIT on Twitter or Facebook, we will create classroom music cues for you for FREE. Just tell us the song you would like to use and the approximate length and you can have a music cue that perfectly fits your classroom. Nate Wolkenhauer is a veteran elementary educator with experience teaching in Florida and Pennsylvania. While teaching, he focused on student engagement and technology integration in the classroom and was recognized as one of the top educators in the state of Florida by the Florida Department of Education. As the current Assistant Director of FCIT, he works to build curriculum and programs promoting technology integration in K-12 classrooms and informal education environments. Each month FCIT publishes a newsletter with short articles on teaching and learning with technology, using digital content in the classroom, and technology integration. Subscribe today! The subscription form will open in a new window. When you have subscribed, you can close the new window to return to this page. iTeach Professional Learning: A project of the Florida Center for Instructional Technology, College of Education, University of South Florida © 2019.